With an eye for sharp-edged abstraction and painterly self-awareness, artist Heimo Zobernig conjures the creative spirit of Pablo Picasso in the digital age. Working in painting, sculpture, video, architectural intervention, institutional critique, and performance, Zobernig explores the relationship between ideas and their artistic representation. "Initially I painted wildly, in all imaginable styles, but later on I settled on radical geometric abstraction as my preferred technique," the artist explained in an interview with Kaleidoscope Press. "My sources back then often had nothing to do with art, which led to clear deviations from convention." 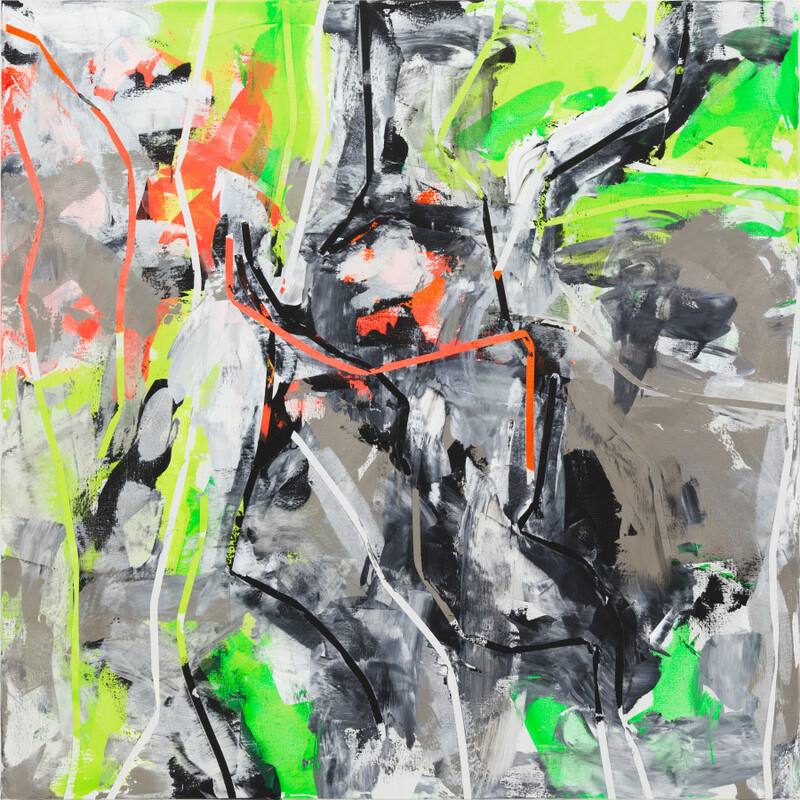 Heimo Zobernig, Untitled, Acrylic on canvas, 2013, courtesy of the artist and Petzel, New York. Zobernig's current exhibition at Petzel Gallery, his third solo show, riffs off a 2012 Picasso exhibition at the Kunsthaus Zurich. This source exhibit was itself a re-creation of a 1932 Picasso show at the same space. In an email to The Huffington Post, Zobernig explained his inspiration with Picasso's "radical avant-gardism with which he precedes the conventions of developments in painting again and again." With neon streaks and an underlying rigid geometry, Zobernig remodels and remixes Picasso's iconically simple line and all the artistic freedom it embodies. The show also features a series of mannequins donning tee shirts, tape and metal studs, creating a space where the human body and the geometric grid intersect. He recalled to Art Forum's Karin Bellmann when, as an art student, Zobernig wanted a dummy for his showroom for no apparent reason and subsequently felt like there was a living presence in the room with him. "It occurred to me that objects could appear alive," he said. "This is a moment where a sensation from the unconscious enters our consciousness. It really fascinated me, particularly because my approach to art usually is very sober." Zobernig's exhibition combines theory, history and a dash of humor in a postmodern visual display which self-consciously reveals its modernist threads. When asked what modernism's titan would think of the contemporary art world, Zobernig replied: "Picasso was always committed to the present and informed about the current happening. That would be the same today." Heimo Zobernig, Untitled, Silkscreen, Linen, Polyester and Steel, 2011, courtesy of the artist and Petzel, New York. (Heimo Zobernig, Untitled, Tape, Emulsion Paint, Acrylic, Kryptonite, Polyester and Steel, 2012, courtesy of the artist and Petzel, New York. Zobernig's exhibition runs until June 21, 2014 at Petzel Gallery in New York.